It seems that we no longer have to wait for the mysterious thing from Audio4fun. Today, the next photo teaser has been out on their social media channels continuing with unique graphic graph, broaden "nickvoice" menu and trendy Smartphone-like navigation buttons. 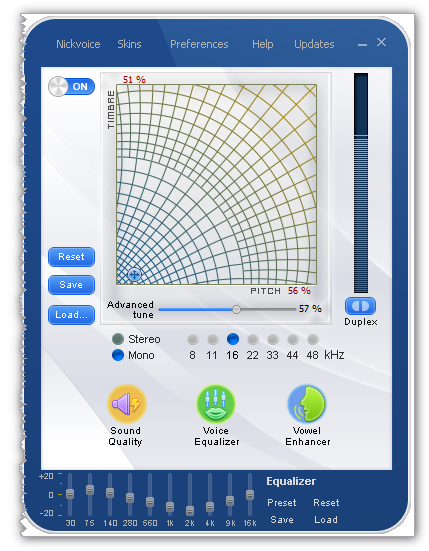 This fourth teaser shows a list of advanced settings specialized in audio and sound such as Timbre and Pitch graph, Sound Quality, Voice Equalizer, Vowel Enhancer and Equalizer bane. These cool settings are cleverly designed in the same panel in order to make audio/voice altering and modifying much easier and more convenient than ever. Stay tune for further update on this mysterious piece.